While SEBI is sleeping, dubious bond offerings and their purchase just ahead of elections beg the question - Who finds these NCDs attractive? The Securities and Exchange Board of India (SEBI) seems to have forgotten its intended purpose – a voice for the shareholders, to ensure that their best interests are served. Time and again, the slowness with which SEBI acts, if at all is glacial. This gives ample time for the perpetrators to hide their trail, obfuscate the malfeasance and take recourse to the courts and tribunals. By the time the highest court rules, decades go by and the white-collar crime is forgotten and the proceeds long digested. The recent decision to allow IndiaInfoLine (IIFL) to do an Unsecured Bond Sale of Rs.2000 crores on the unsuspecting Indian public is shocking. 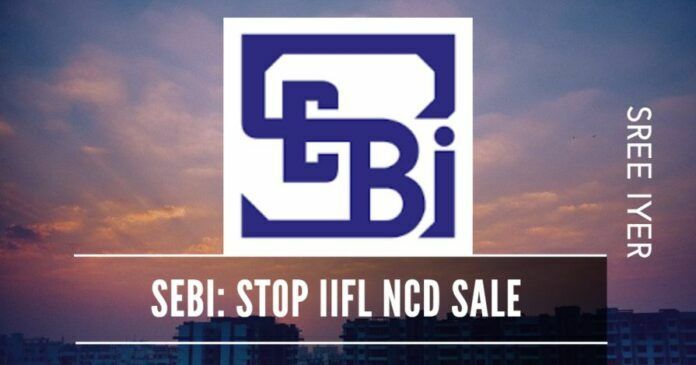 SEBI is looking the other way on this despite specific instructions from Mumbai’s Economic Offence Wing (EOW), Serious Frauds Investigation Office (SFIO) to declare IIFL as not fit and proper for its role in the NSEL scam. Think about this – Every HNI that I know will squeeze water from rocks before making even a paisa of investment. What is so attractive about this offering that is making HNIs salivate? Sale of Bonds still going on? 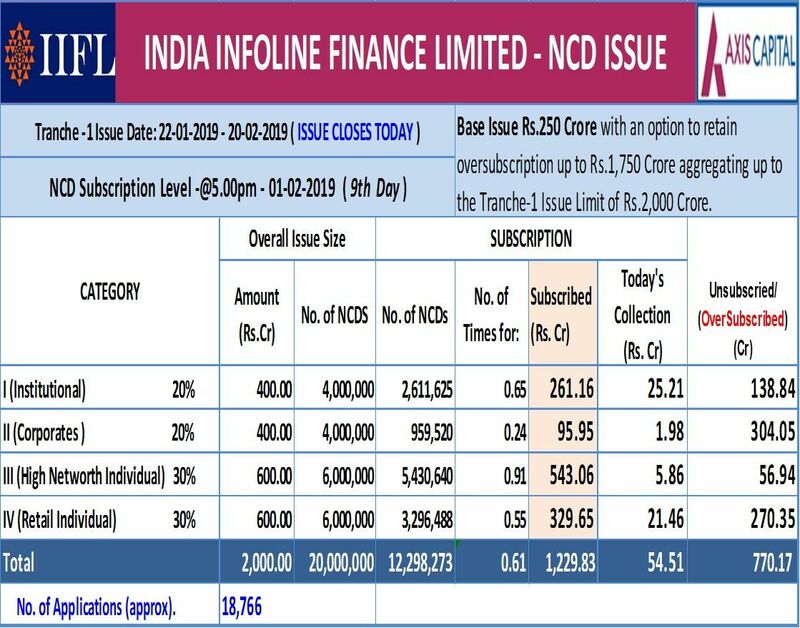 An unsecured Non-Convertible Debenture (NCD) of Rs.2,000 crores was initiated by IIFL on Jan 22nd. A People Interest Litigation (PIL) was filed in the Madras High Court urging the court to stop this by an IIFL shareholder on Jan 25th. Despite this, the sale proceeded. When there are so many question marks against this brokerage, why is SEBI not stepping in? The bond sale will be on till Feb 20th and before you know it, another financial scam could be forming right under our noses. The company has raised approx. Rs.1229 crores (see Figure 1). Has the NCD offer been closed? Three show cause notices. That is all the SEBI has managed thus far in dealing with the brokers associated with the National Spot Exchange Limited (NSEL) crisis, one of which is IIFL. That there is something fishy was known almost five years ago, when the EOW, after interrogating borrowers of the crisis-ridden National Spot Exchange Ltd (NSEL) and attaching properties valued at about Rs 4,300 crores, threatened to freeze the properties of the exchange’s brokers. A quick search for the same post online shows a slightly modified version, with the name of IIFL removed! What you are seeing is an attempt to sanitize a name so it won’t show up, should an investor take the trouble of doing due diligence. But the proof is in print and SEBI knows it. Yet it keeps silent. SEBI cannot run away from its responsibilities – it must remember that it is solely for the shareholders and not vested interests. The list of cases on which SEBI has not acted is long – NDTV, Tata Sons come to mind. This is no way for the sole regulatory agency to perform. Mumbai’s Economic Offence Wing (EOW) recommendations, Serious Frauds Investigation Office (SFIO) findings have, after extensive investigations written to the SEBI to call brokers such as IIFL not fit and proper. SEBI could have halted the IIFL issue until the court decides on the PIL matter. What is the rush? It does not take a rocket scientist to figure out the reason. Hint: It is a mega event about to descend on the Indian public. In conclusion, just as SEBI ordered ICICI Mutual Fund to return Rs.240 crores invested in I-Sec IPO, it should follow suit and order IIFL to return the money collected thus far because this deal stinks just as bad. Previous articlePayback time for Mayawati!!! Next articleLiar, liar, pants on fire! On many fronts and sectors NDA government has done well when compared to UPA!&2. On economic front people are not happy.PM Modi does not understand this because he trusts his right hand man minister and does not follow suit thereafter!! On this count he should not a preferred PM candidate for a second term. Even after innumerable times and few reminders PM does not seem to care on SEBI/PE Notes or try to understand hot funds sitting as forex “reserves. A good PM is lacking ‘few more” good advisors around him. This is mosquito bite compared to the 6000+ crores that the fast asleep SEBI allowed IIFL to raise on a pre-IPO Fund last year . Between fees on the fund, investment bank revenues on the IPO and stuffing the same IPO on unsuspecting fund holders, IIFL made a mockery of conflict of interest principles. The mark yo market on the fund must be shocking but as usual SEBI has raised no question to IIFL whatsoever . In India, how safe it is, to invest in Stocks & MF, etc,. How Credit Suisse and big fund managers got it wrong!